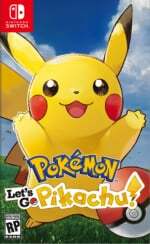 The upcoming Pokémon: Let's Go, Pikachu! and Let's Go, Eevee! are now available to pre-load on the Japanese Switch eShop, revealing the game's file size and other little bits of info in the process. Yes, both versions of the game can now be found on the eShop (at the time of writing, most regions can't access the pre-load function just yet), giving us a chance to take a good look at the game's specific details. The game will support Japanese, English, Spanish, French, German, Italian, Korean, and Chinese languages, support 1 - 2 players (which we already knew), and that all-important file size stands at 4.1 GB. Thankfully, 4.1 GB shouldn't be enough to cause too much concern, even for those without a micro SD card. For the sake of comparison, Super Mario Odyssey takes up 5.5 GB, The Legend of Zelda: Breath of the Wild takes up 14.3 GB, and the closest title we could find in terms of size (without slowly wasting away in the depths of the eShop) was Snake Pass which takes up 4.2 GB. Hopefully, a quick shuffle of any larger games should be enough to comfortably fit those pocket monsters into your Switch, but if not, our guide to suitable micro SD cards for your Switch should come in handy. Are you planning on buying the games in digital format? Or will you be treating yourself to a physical copy? Let us know with a comment. Going physical for this, so it won't be an issue regardless. Pokemon Let's Go is bigger than Dark Souls and I'm assuming they're using the 8 GB cards for it, so Bamco really doesn't have an excuse for the audio issues in Dark Souls besides wanting to cheap out. I came to read the negative comments about the game. They should start to pop out anytime now. @Devlind Can’t wait, highlight of my day. Going digital. This game will be awesome (negative comment, not from me). That size seems reasonable enough. Get your data planners ready! I love Pokemon, I'm going to love this game, and I love you and everyone here! We love Pokemon, we love you too. @Frenean That's so nice of you. I don't know if I would go as far as to say that I love everybody, but I do wish they do alright. Hopefully everyone that gets the game enjoys it. @NewAdvent That's a shame, but hopefully we get something. I hate Pokemon Let's Go Eevee and Pokemon Let's Go Pikachu for the Nintendo Switch. And I especially hate you, Devlind of NintendoLife Comment Section. @Devlind Do you like troll baiting? It's okay if people don't like these games. But some people say it in a provocative way and it really doesn't have to be. Now I gotta see what game to drop. Probably Paladins only played that once or twice. I'm pretty much exclusively a digital guy. I'll probably buy physical for smash though because that game is going to be huge. @BladedKnight But what if @TheGhostWhoWalks also takes my answer as a yes? That would contradict your statement just like yours contradicts his. That could open a time-space rift and create two different realities, one in which I like troll baiting and another one where I actually want people to write something negative and I don't know if we are prepared to deal with a situation like that. @Gravitron I’d agree. Paladins is good but matchmaking is abysmal now. Let’s Go E/P will defo be a better use of space. While I have 0 interest in this series of Pokemon games as I am waiting for gen 8. The reason I am not interested in it is the "GO" style gameplay of it. While I did play Pokemon go for a small bit I lost interested in it very quickly and I can see it being the same for this game also. Everything else people are complaining about the game e.g "Friendly rival" I am not fused about. Though for the people who are excited for the game then I hope it is as good as you are hoping it will be. I was expecting at least 2GB. Nintendo is the king of compression after all. I think I'll wait on purchasing this game actually for now. I wanna get it with the Pokéball controller and it's just a bit too expensive at the moment, besides the Gen 7 games kinda killed my hype for Pokémon in general, so currently it's kinda whatever honestly. @Yosher What about Gen 7 did you not like? Still not sure if I want to play this game. I like the gameplay of Pokémon Go, it's easy and simple (although some things could be a bit faster, like the dialogue when you catch a Pokémon). But to put that same gameplay instead of wild battles just looks so bland and boring. The rest of the game looks so good. Pikachu and Eevee are adorable and the visuals look really pleasing (although the character design feels a bit like a generic mobile game). Sigh, what to do. @NoxAeturnus Too hand-holdy, too much of an emphasis on Z-moves, character animations bothered me very much, way too easy, not a fan of the Trials, plus Mega Evolution is still present which along with Z-moves really pulls the natural feeling of Pokémon away. Stuff that maybe not everyone agrees with and/or are maybe dumb reasons but they all contributed into making the games extremely unenjoyable for me. I really wish it was different, because up until Generation 5 I absolutely loved Pokémon. @Yosher i can agree with gen 7 being a little to hand-holdy as well as easy. I think 5 managed the best balance between story and freedom (and the two difficulty settings were an addition they should’ve kept). Otherwise, I do like trials (gyms were getting repetitive, not that trials are a HUGE difference but it was a change) and Z-moves and mega evolution gave some less viable Pokémon a chance to become usable. But I understand if people don’t like those changes, everyone has different tastes. @ShadJV My reasoning for not liking Z-moves and Mega evolutions is solely for the fact that it makes Pokémon feel less like wild animals that you domesticated and more like battle tools and 'look at what the power of friendship can do' excuses. It's just not Pokémon for me. But yes, everyone has different tastes, and sadly with the direction Pokémon is going right now, it's not going to be for me anymore. A real shame honestly. The only thing I got from this article is we need a filter for file size on the Eshop... And a better Eshop layout. It would also be nice if the next revision had 128+ gigs by default, at least. Nintendo Switch games ranging from 4GB to the most bloated at 28-30. @Yosher Well I'm pretty sure mega evolution was postgame for Sun and Moon (and Ultra). @Yosher I think you make a fair point about those mechanics making Pokémon feel more like battle machines than wild animals that you befriend and then possibly use for battle. I will say (and I’m not necessarily trying to change your mind) I still feel Game Freak/Nintendo sdoes a decent job in making those types of mechanics (more or less) optional. I mean, there are obvious story elements that feature and push them. But for the most part, you don’t necessarily need to bother with them. 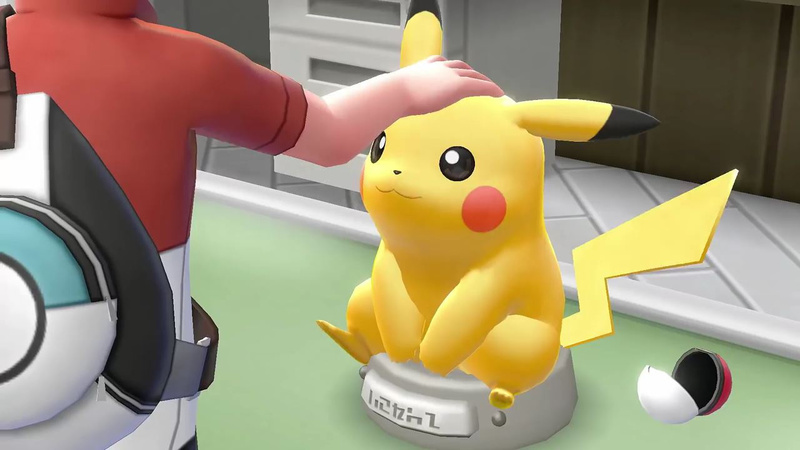 I'm going physical (Pikachu) but I will pass on the gimmick controller. If that isn't an option, then digital it is. I just want to relieve Pokemon Yellow with my youngest daughter. Really looking forward to Pokémon Let's Go. Today I have pre-loaded Let's Go Pikachu. Interesting tip - it's worth pre-loading on the Japanese Eshop. You can play the game in English and the time difference means you will be able to play the game on the evening of the 15th November in the UK. It's gonna be such a great nostalga ride! As someone who played the original games back in 1998/99, I love Kanto so much and these games have clearly been made with a lot of care and attention to detail. Not bad, I'll see if I want to buy it after I demo a friend's copy after the launch. @Setery It's still in the game. Playing online, you can't escape it, and I think there's some NPCs who use it too. @UmbreonsPapa Even if I don't use it, there's still a fair amount of NPCs who use Z-moves even when you choose not to. It's really annoying when you just wanna have a normal battle and suddenly OH BY THE WAY HERE'S A NUKE BECAUSE F- YOU! ...I find it incredibly annoying and each time I see the opponent using a Z-move, I just turn off the sound so I don't even have to hear it as I put my 3DS away for a minute. And optional or not, I'm basically blocked from battling online because nearly everyone has one of these things in their team, so I can barely play online without being subjected to these terrible things. And they're a part of the series now, I doubt it's ever going away at this point. Nice to see it fairly small. I'll be grabbing LG Pikachu physically though. I've not paid it much attention as I'm not a huge Pokemon fan, but I like the series enough that a new mainline release on Switch would be a day one purchase. I just haven't really invested any time in figuring out exactly what this game is trying to be... is there enough traditional Pokemon in it, or is it more akin to a padded out variant of Pokemon Go... If it's the latter, I can see the wide appeal, but it's not for me I'm afraid. I don't like the idea of this game but still haven't decided if I want to be a hypocrite and purchase it. @Yosher I haven't played through Sun and Moon since it came out. But I don't seem to recall many NPCs using Z Moves. Or Mega Evolutions. As @Setery said, that seem to be a feature saved for post game. But it's been almost two years since playing through the entire game. So I may not be remembering things correctly. As for their use in online battles, I can't comment on that. Have never gotten into online battling. On rare occasions when I'm extremely bored, I'll do one. It would be nice if more choices in rules could be set to disable certain options for players that don't want them. @Yosher Those all sound like reasonable criticisms. The series has certainly gotten bloated with gimmicks.